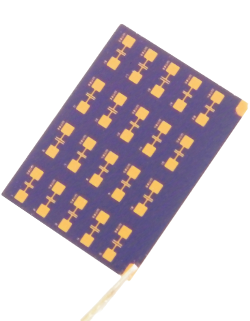 The High Density OFET Test Board can provide high precision, current-voltage measurements of up to 20 OFETs on a single substrate. As such, this test board can speed up your research and help you to achieve more reliable, statistical results. It is compatible with our High Density OFET Fabrication System as well as with our Prefabricated High Density OFET Substrates. Until now, high density OFETs had to be tested using a mechanical needle probe station which was a delicate and laborious process. The substrate bracket on this board features 20 gold-plated, spring-loaded pogo connectors to make a reliable electrical contact with each device on the substrate. Not only does this make the testing process simpler and faster, it also ensures uniform electrical contact with every single substrate tested. The substrate to be tested is simply dropped into the testing holder and secured in place with a swivel push-fit lid. The optical window then provides access for photosensitivity, photodoping and sensing measurements if needed. OFET measurements are made using two source measure units (SMUs) connected via BNC connector cables: one to set the gate voltage and measure any gate leakage current; the second to set the source-drain voltage and measure the current. The board is also neat and compact at just 200 mm2 which is small enough for easy use within a glove box. This product is covered by our FREE 2-year warranty. 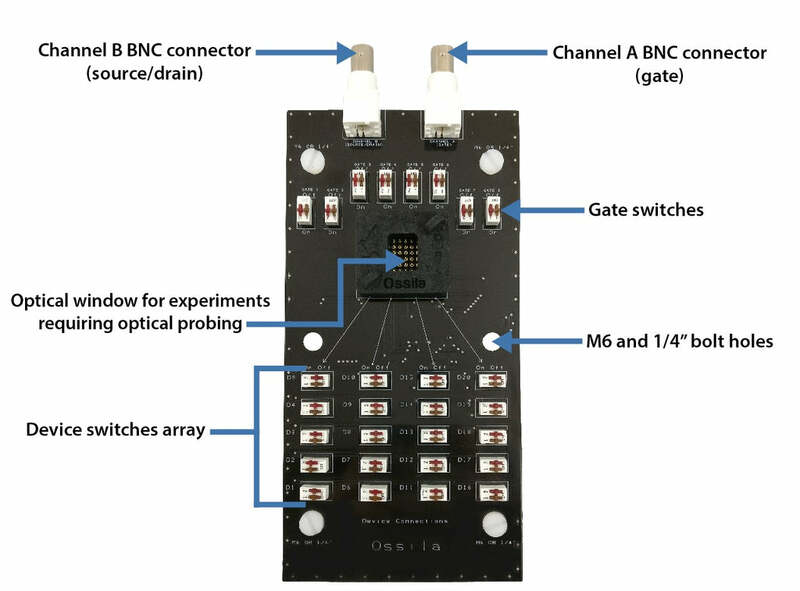 High Density OFET Test Board diagram. Source-Drain switches 20 independent switches to Channel B; one per device. The High Density OFET Test Board has been designed to be compatible with our High Density OFET Fabrication System and our Prefabricated High Density OFET Substrates. 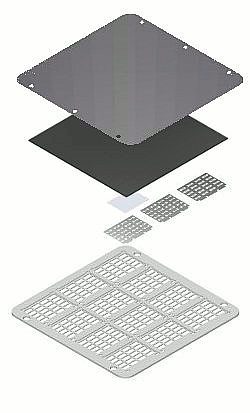 Prefabricated substrates can reduce OFET fabrication time - simply deposit your semiconductor on top - making them ideal for high throughput screening where reliable statistics are required. The High Density OFET substrates in particular allow for statistical data to be collected, with reduced variability between OFETs and reduced cost and processing time per OFET device with 20 devices on a single substrate. See all the available HD OFET substrate variants. If you prefer to fabricate your own OFETs, you can use our High Density OFET Fabrication System which contains all the relevant components needed including substrates, interchangeable masks, lower support and lid. Evaporation Stack for HD OFET System and our Prefabricated HD OFET Substrates. To the best of our knowledge the technical information provided here is accurate. However, Ossila assume no liability for the accuracy of this information. The values provided here are typical at the time of manufacture and may vary over time and from batch to batch. "We used Ossila's substrates in some of our final year projects (both BSc and MPhys). The high quality and ease-of-use of Ossila’s substrates allowed us to run several undergraduate projects,..."